Fantasy football drafting is an art in and of itself. 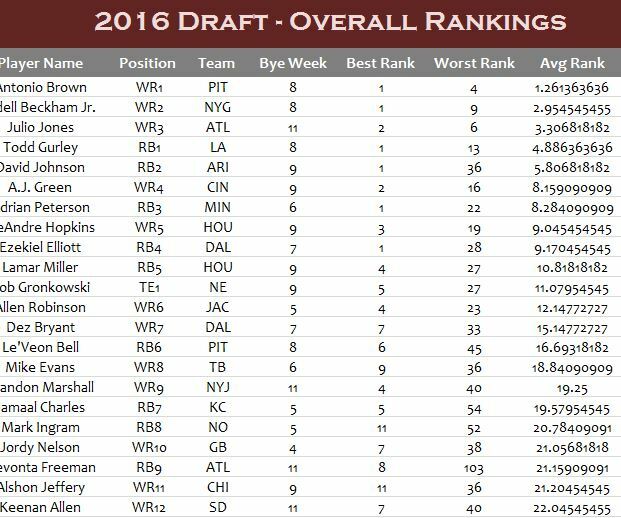 The free 2016 Draft Overall Rankings is the best way to choose your teams this year. With all the current stats on every player and simple format that allows you to organize lists by player position, you will quickly and easily build the ultimate team this year for your fantasy football league. This document is just the first step on the road to glory. All you need to do is follow the directions that have been given below to learn how to download and use this free template today! To download the free template file directly to your computer, just scroll to the bottom of this page and click the link we have given you. Once you have the document, click on the file to open it. Now, you will see there are multiple tabs to choose from. The main tab is the “2016 Draft Overall” tab. This page contains every player and their core statistics. You will see the seeded rank, player name, position, team name, bye week, best rank score, worst rank, average rank, and the standard deviation. If you go back to the list of tabs, you can customize your team even faster by selecting the position you need first. Click the “QB” tab to open a page containing only a list of quarterbacks. This will make drafting so much faster and more efficient. This template is the best way to start the season off and crush the competition at the same time.